I painted this view of the Palace of Holyroodhouse (or Holyrood Palace) in Edinburgh, Scotland, for some friends who had been there on their travels and provided me a small picture to work from. It was such a small picture that first I had to blow it up larger, and I still wasn’t sure if some white things in the foreground were sheep. My friends thought they could be, and liked the idea, so in the painting there are sheep, along with the travelers themselves taking in the view. The couple who commissioned the painting are both novelists and we talked about how we start the dialog of what’s going on so a story comes to life. They use adjectives to describe a scene, where I use color and texture. As a writer or a painter, it’s all about interpretation. Dancing to the music with jingle bells, celebrating a very successful show. We helped out Lila Mae, too! Wishing you times of joy and celebration! 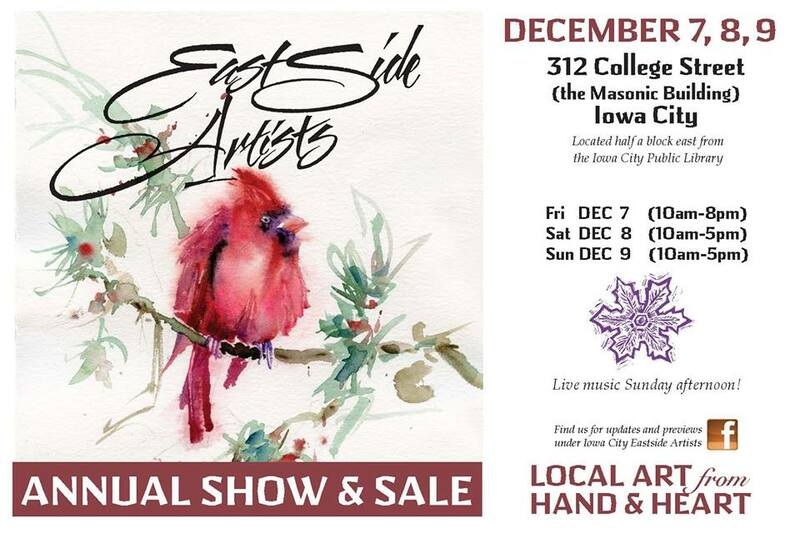 (Above left) The postcard for this year’s Eastside Artists Annual Show & Sale features my cardinal painting. I sent them three to choose from, and they picked this slightly frumpy young bird with his feathers a little ruffled.